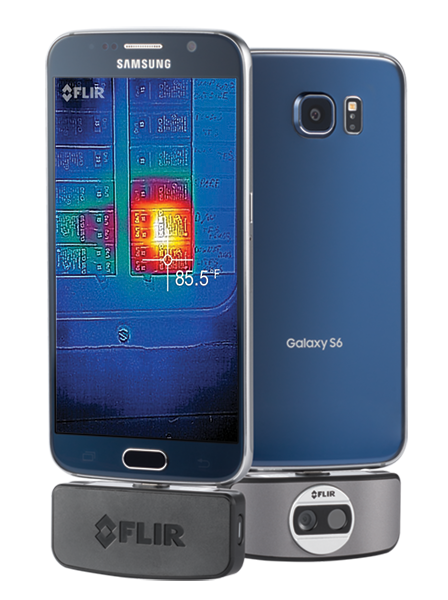 With a similar name to the thermal imaging camera protection case for the iPhone, the manufacturer FLIR delivers thermal imaging camera plug-in modules for Android* / iOS*. These have better technical data and even a small battery integrated. 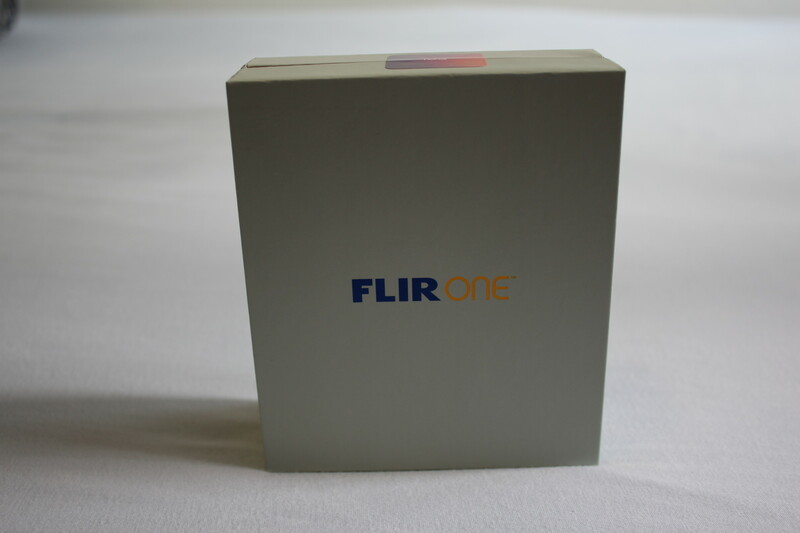 We have subjected the device to a comprehensive test and give the functional scope as well as many example pictures. 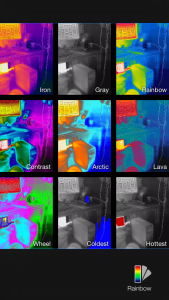 Learn more about application areas of this thermal imaging camera as well as the strengths and weaknesses of the module. 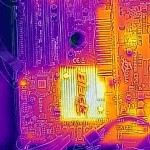 FLIR is offering with the second-generation thermal imaging camera module from California a very good product. 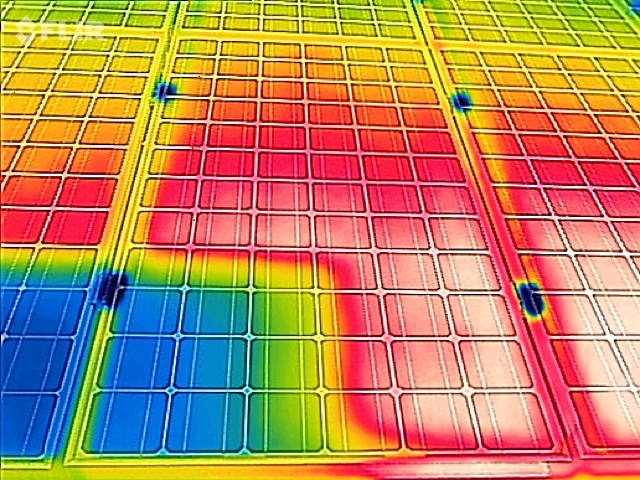 Compared to the previous models the sensor resolution was significantly improved and the weight of the module was reduced. 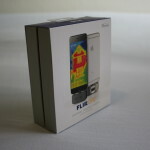 It was developed in Santa Barbara, California by FLIR and assembled in China. Since approximately mid-2015 it is available. 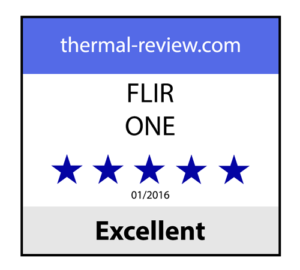 Like its predecessor, the FLIR ONE is aimed at a technology-oriented target group, beginners in thermography and early adopters. 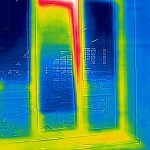 But also tradesmen and property owners can use the device in practice for simple investigations. 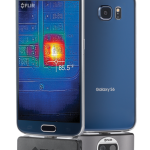 Now FLIR has also thought of the widely used Android smartphones and offers the plug-in module in an iOS version and an Android version. Both have the same performance and functions. The scope of delivery included a protective cover made of sturdy rubbery plastic. 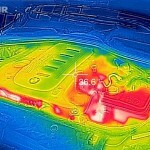 In this cover, the FLIR ONE can be stowed away and is well protected in case of falls and bad weather. Dust is also kept away from the lenses during transportation. 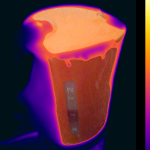 However, the housing of the thermal imaging camera is relatively stable in itself. The workmanship is of high quality and no defects could be found in the test. 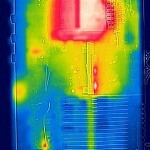 At the front you can see the IR sensor and the camera positioned for the visual spectrum next to each other. 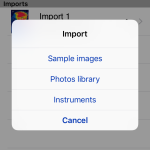 This allows the device to calculate an combined picture. 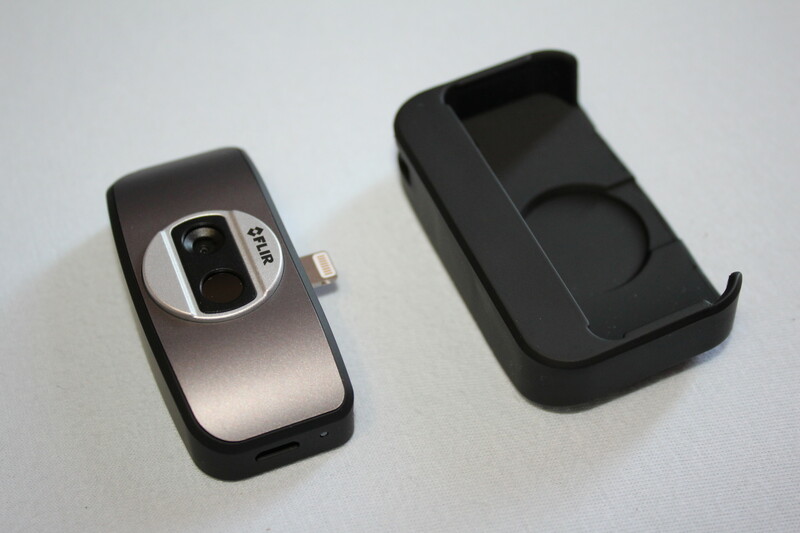 Due to the small dimensions, it fits into every pocket and can be stowed in the protective box. 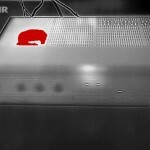 When removing from the protective box one should be careful, however, since the module tends to bounce out. The size of the plug-in module does not interfere with the iPhone and the operation of the touch screen is still possible without problems. 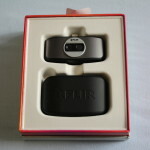 The wrist strap can be used to secure the protective sleeve with the included carrying strap. 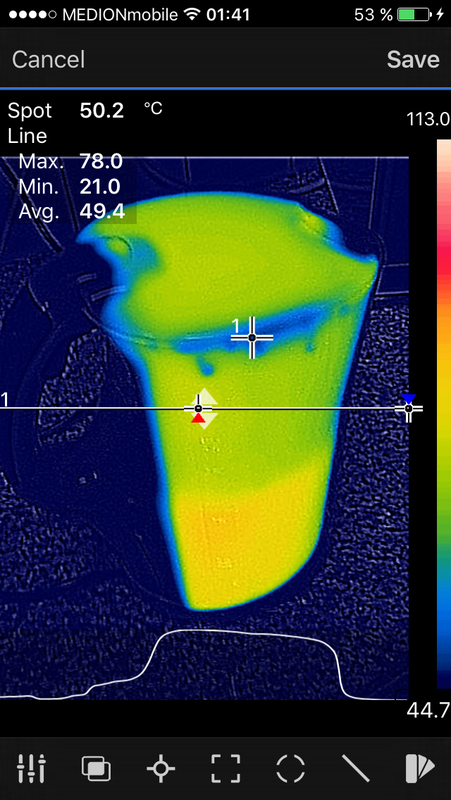 However, an eyelet is not found on the FLIR ONE itself. The manual recommends first charging the integrated battery before first use. A suitable micro-USB cable is included. On the right hand side you find the charging socket and on the right the switch for switching on and off. If you plug the module to the smartphone it has to be turned on separately. 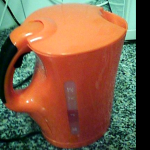 At first, an LED on the device flashes orange, then green until it is ready. 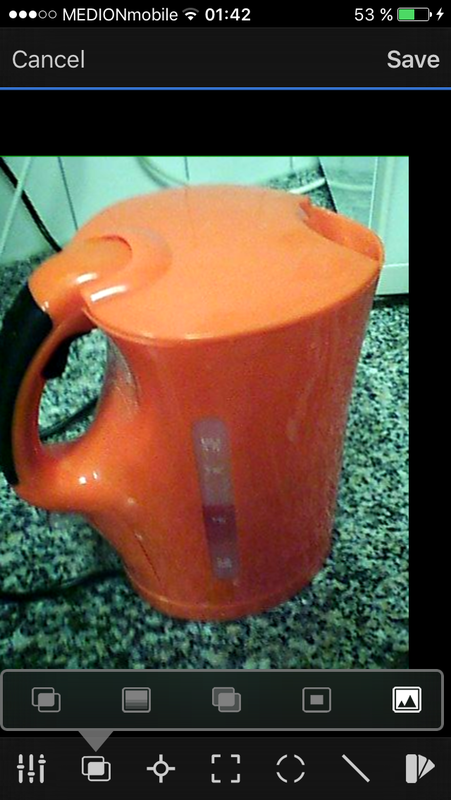 After about 15 seconds everything is ready for use. With the iOS, the appropriate app is started in the start screen. Unfortunately, each time a dialog box is required to allow access to the device. 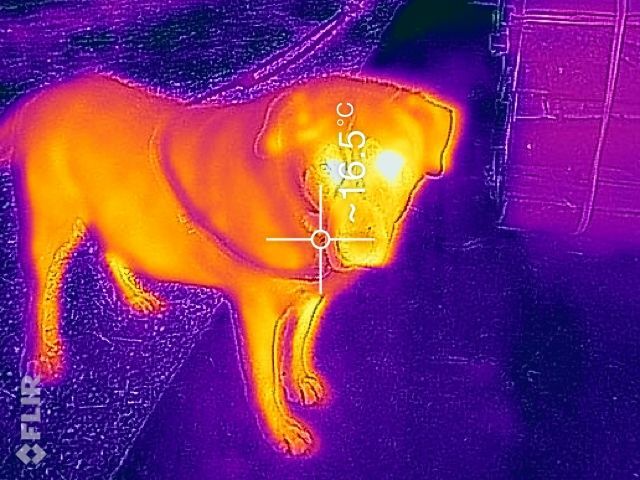 Like many other thermal imaging cameras, the FLIR ONE performs a small calibration every few seconds. 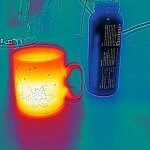 Acoustically, this is very discreet, but unfortunately the display flashes. This is not the case with video recordings. 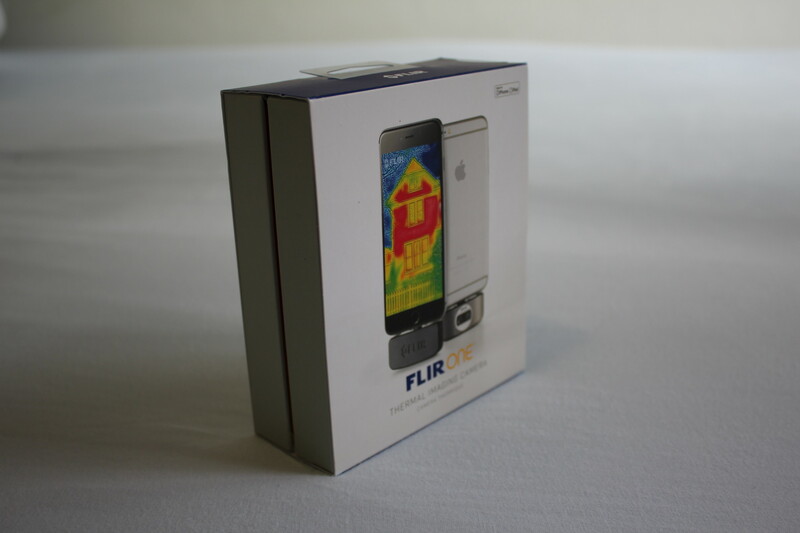 The FLIR ONE has a fixed focus and is therefore relatively unproblematic in handling. However, the distance to the object must be specified for the MSX Image Combining. This is relatively well solved. With the aid of a bar, you can quickly adjust the display and check on-the-fly if it is set correctly. 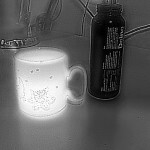 In the test, this was quite easy, however there was a small residual deviation, but mostly not noticeable. You will quickly get used to the correct distance for each shot. With the device very good close-ups can be made. The MSX handels a distance of about 20 cm (0.66 feet) very well. 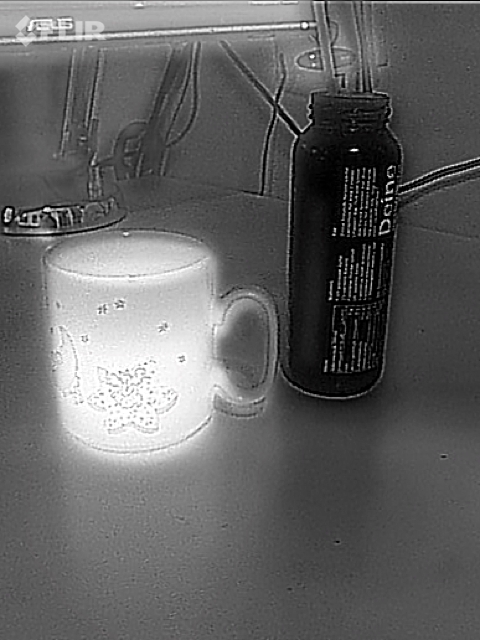 With the IR image alone you can get even closer. 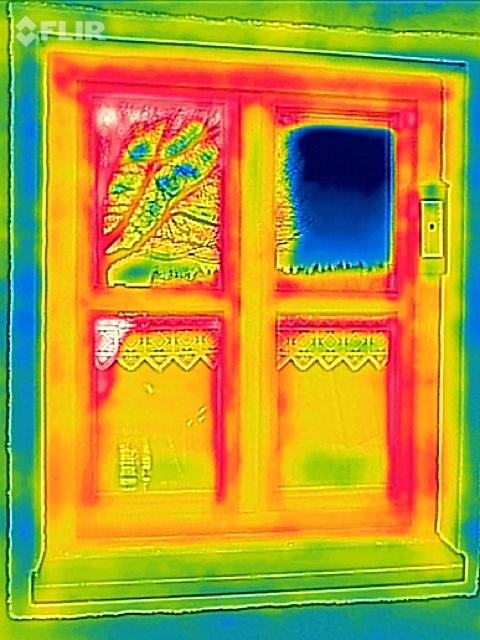 The FOV (Field of View) makes it possible to create great indoor pictures of windows and doors as well as switchboxes. For long distancse, of course, it is not so well suited . This is especially noticeable when monitoring terrain. 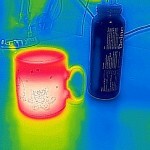 The resolution of the IR sensor is praiseworthy for the price class. 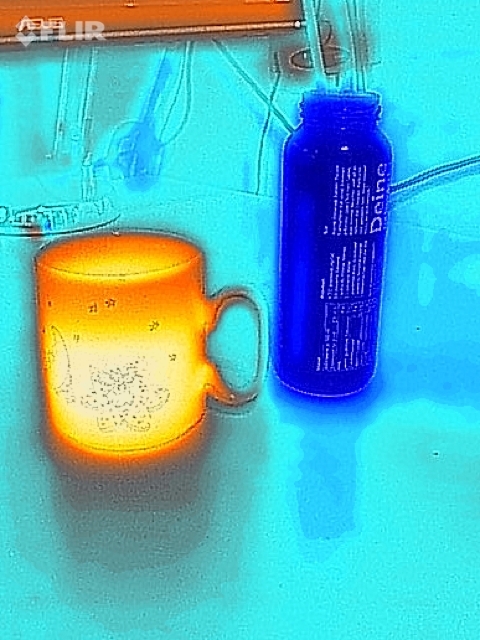 Thanks to the MSX (Image-Combining) you can take amazing pictures with it. Even beginners do not need much experience to make beautiful pictures. 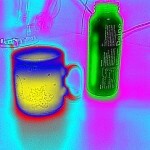 The images do not tend to be blurred or blurred. 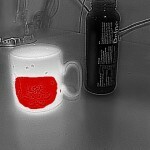 You do not have to stop for a long time to adjust the sensor or the like. Plus points for that. Of course the MSX works only with sufficient illumination in the visible spectrum. For bad lighting situations the mobile phone LED can be activated so the MSX still works. 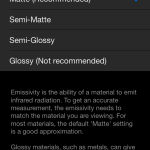 The emissivity coefficient can be adjusted, but unfortunately only in four steps ( “Matte”, “Semi-Matte”, “Semi-Glossy” and “Glossy”). 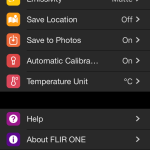 However, an exact adjustment of the coefficient is possible afterwards with the app FLIR Tools. 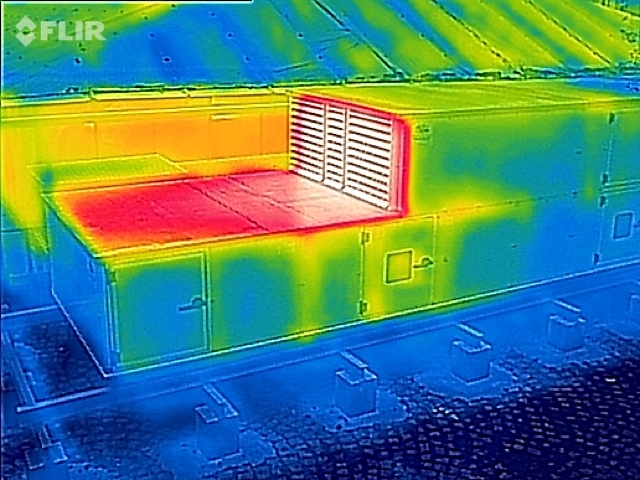 In the test, however, the detection of the temperature at the measuring point with a correct choice of the emission coefficient is relatively accurate. 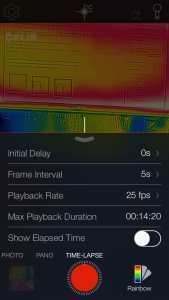 If you turn the smartphone, the recording screen turns also and the embedded labels are adapted accordingly. The power consumption of the module is limited and does not burden the smartphone thanks to its own battery. 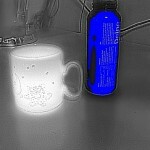 Depending on the usage, it will last 30 to 60 minutes. It is however again relatively fast charged in about 60 minutes (USB cable). 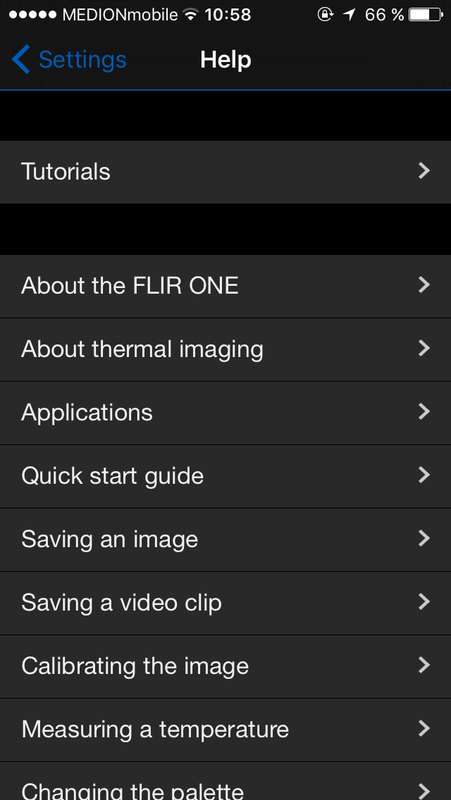 In the FLIR ONE app, there is also a small collection of topics under “Help”. 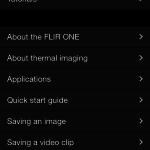 In the “About FLIR ONE” menu item you can update the firmware and display the version number. This makes it possible to select the right representation for each application and to improve contrasts if necessary. It is nice that the selection preview is updated live in all variants. The two “Iron” and “Rainbow” palettes are very versatile and perhaps the most intuitive for the human viewer. 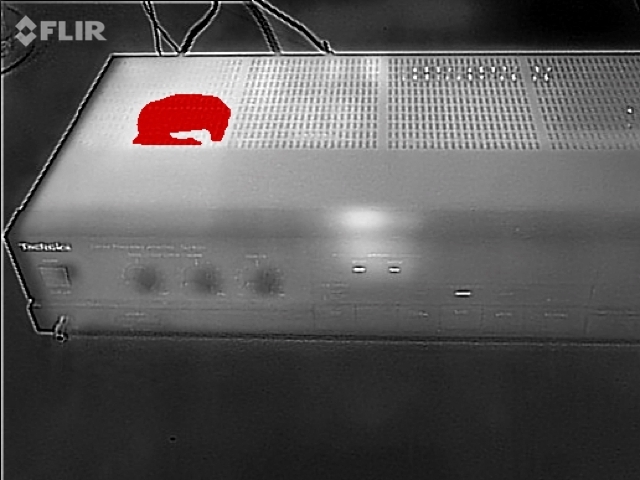 They are suitable for a variety of technical investigations as well as for living objects like animals and humans. 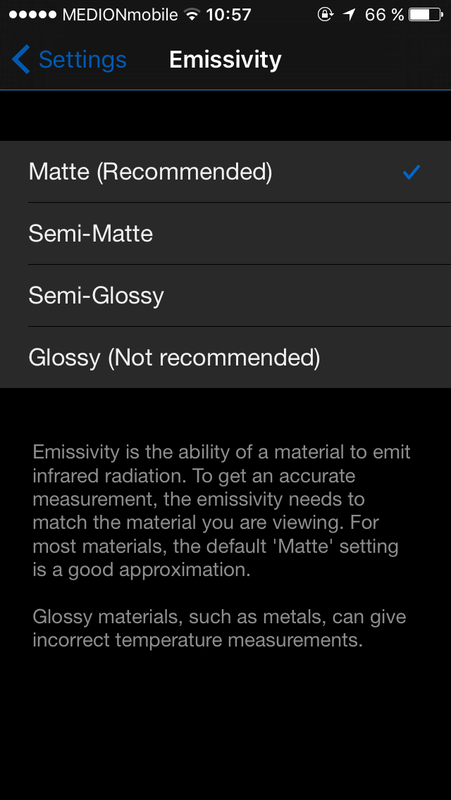 “Lava” is also suitable for the diagnosis and examination of electronics. 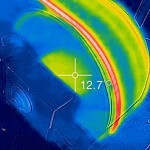 With “Wheel” you can make weak contrasts more noticeable, so that you can detect the smallest temperature differences. 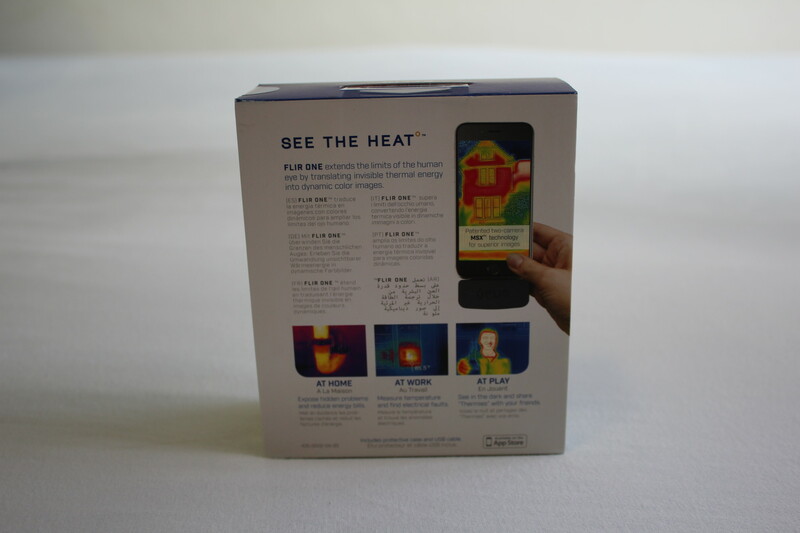 “Hottest” is well suited for monitoring objects in a terrain as only the hottest points are marked. 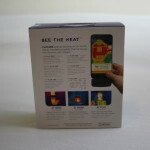 Unfortunately, the temperature range of the scale can only be changed afterwards. 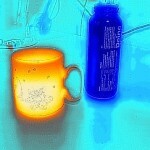 However, a fixation is also possible as a workaround. 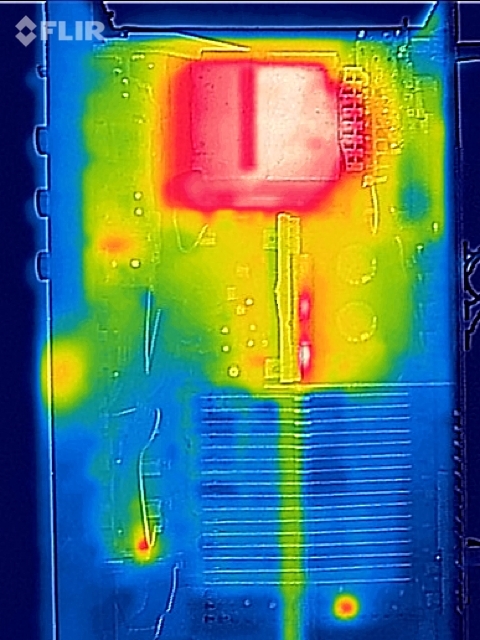 Video recordings with the FLIR ONE seem a bit jerky, as if the framerate is very low. 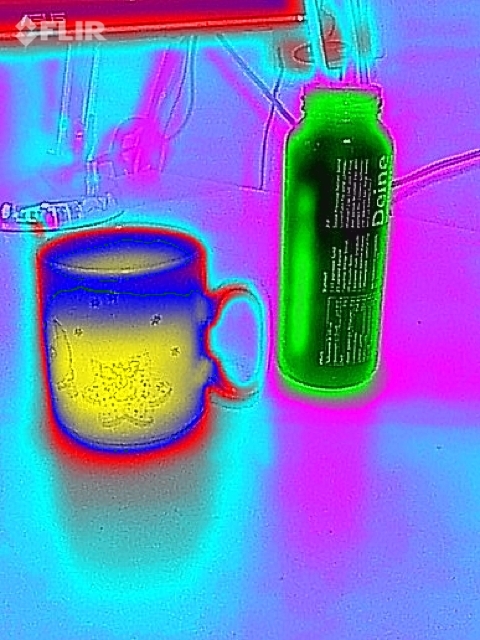 The image is stable and not blurred. As far as the quality of the frames is concerned, one can not complain, since these are almost as good as individual recordings. 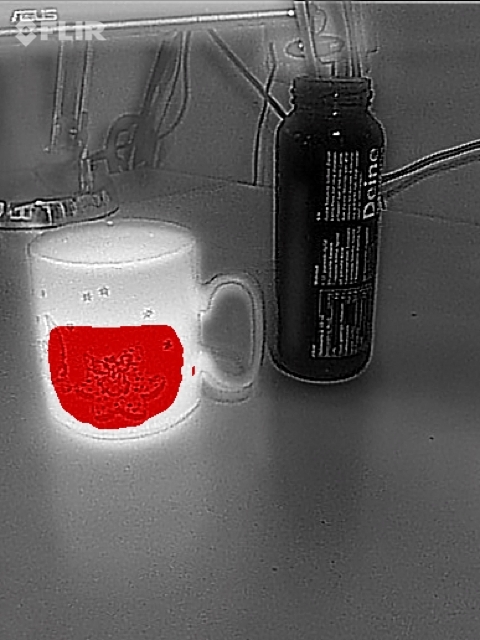 The calibration intervals are not recognizable in contrast to the normal recording. They only express themselves in a short “stutter” in the video, because during this time, of course, nothing is recorded. 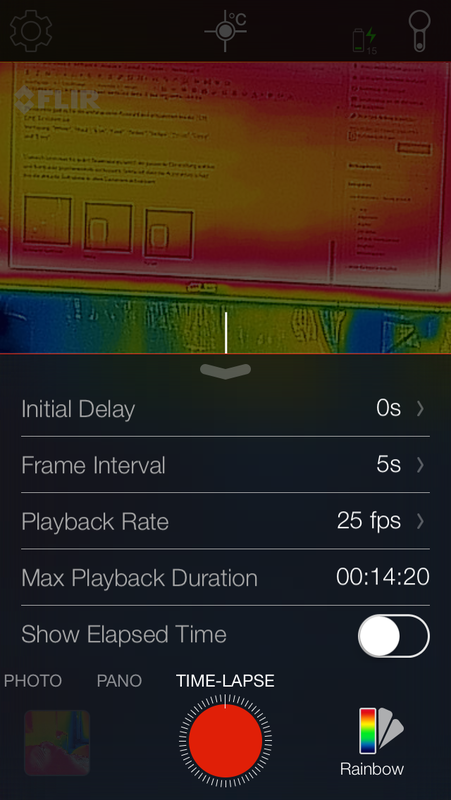 The app was very stable during the video recording test and could also record longer intervals. Overall, this feature is considered to be okay. 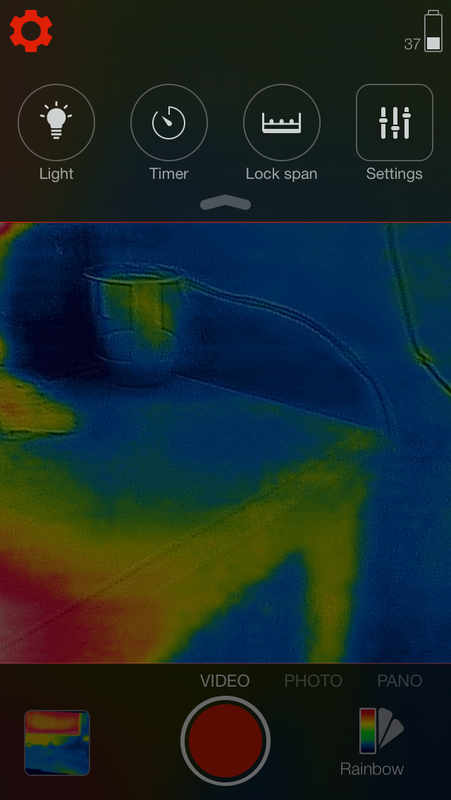 It is also possible to activate the option “Lock-Span” for the recording so that the temperature scale does not change automatically and you get an absolute result. 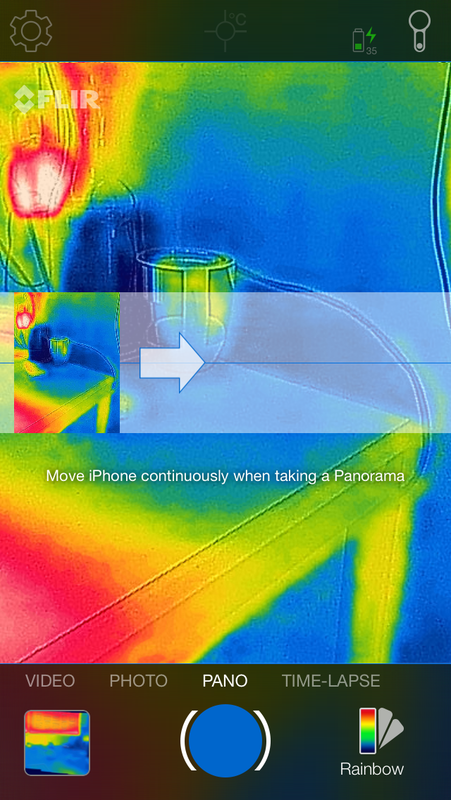 With the FLIR ONE, even panoramic images can be produced in the IR spectrum. This goes like you are used to from smartphones and is relatively simple. 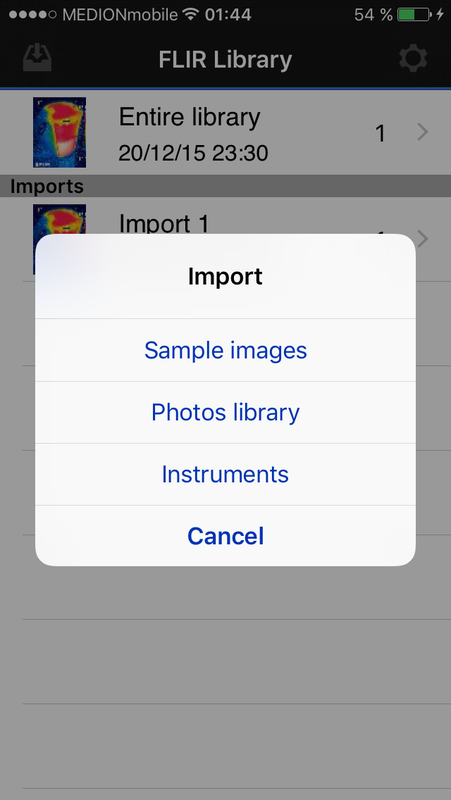 Follow the instructions on the display and move the device until the bar is full in the display. Then it takes sometime until the overall picture is “stiched together”. Jitter and differences in height are automatically compensated for. The function is however rather to be seen as an addition and a toy function. 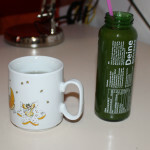 Panoramic images are only possible in portrait format. A convenient function is the possibility to make so-called “time-lapse” recordings. This means that, for example, an image is taken every 5 seconds, and finally, after 25 frames, the whole image is combined into one film. 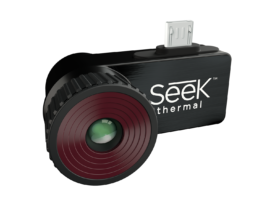 This is useful if you want to observe slow thermal changes in a timed manner and can not record video material (storage space) for hours. In the test, the function worked very well, but one must always be aware that between the recordings, of course, something can happen that later does not appear in the movie again. 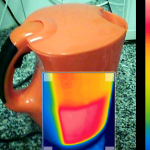 This function is, however, perfect for examining a water cooker for example, which heats up slowly. 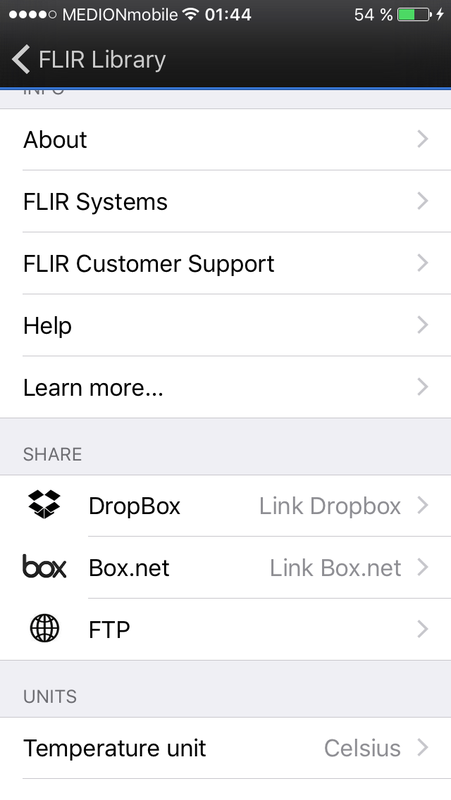 In a separate app, which is provided free of charge by FLIR, you can import the already made recordings again and edit them later. 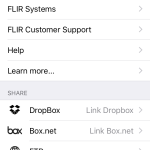 Since all records are stored in a proprietary format, FLIR Tools can be used to customize and analyze the images. 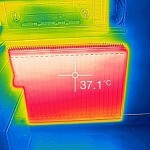 Several temperature measuring points can be retrofitted as the most important function. 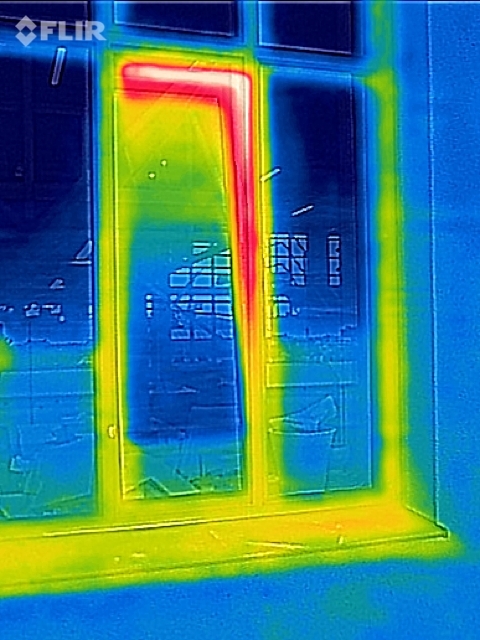 The emissivity coefficient can also be changed afterwards – this is only possible for the entire picture. 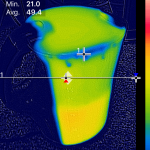 It is not possible to change the measurement spots individually in terms of the emissivity coefficient. The measuring scale, which determines the conversion of the IR measured values into the colors of the pallets, can also be changed. Upper and lower measuring points can be moved individually or together. The palette itself can also be changed. There are further measurement functions besides the spot measurement, which can be inserted into the picture. A line measurement with display of the max, min and average value is possible. 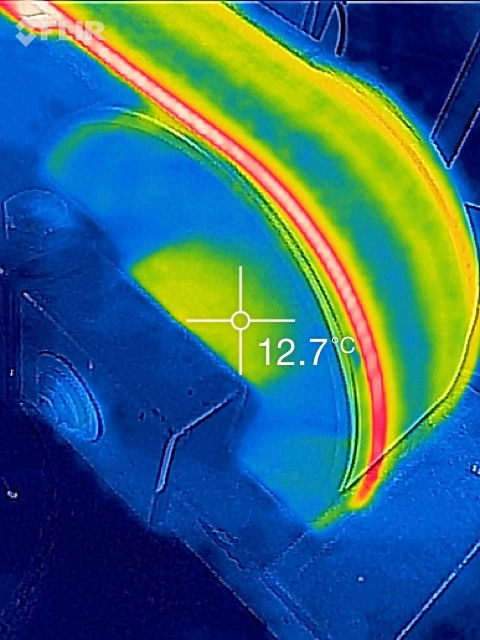 A graphic temperature curve along the lines is also shown. A freely adjustable measuring circle and measuring rectangle are also possible. Great is that the general display mode can be changed. For example, you can activate a picture-in-picture display, in which an arbitrary rectangle is displayed in the visual image in IR display. 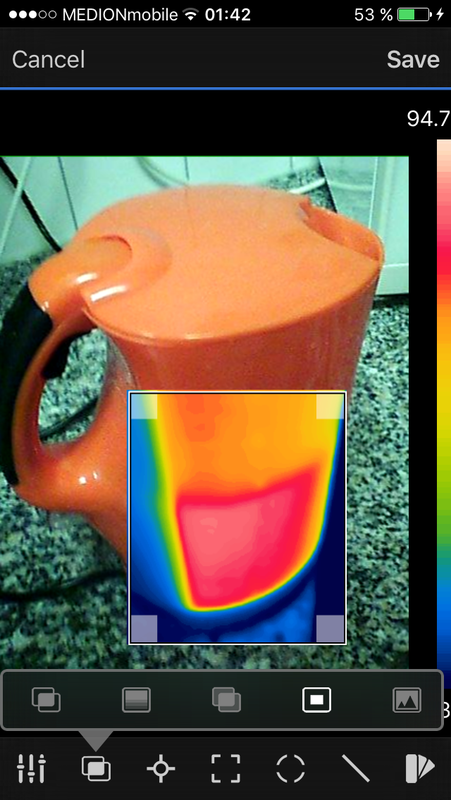 In a further special mode, the visual image and IR image are – depending on the temperature, they are superimposed. 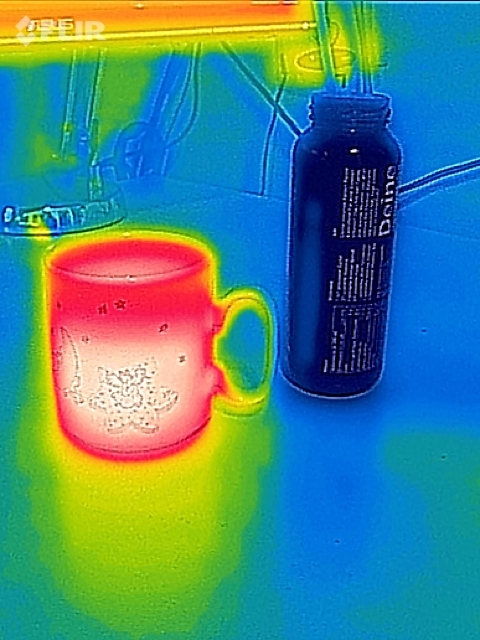 The visual image or IR image alone can also be displayed. 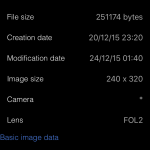 Furthermore, file information such as size, date, pixel, distance, humidity, etc. can be displayed to the images. 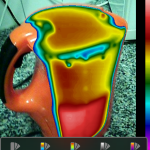 The app allows even a small thermography report to be prepared and saved as a PDF. Probably the most important feature is the sensor resolution of 160 x 120 pixel, which is quite pleasing in the price class. 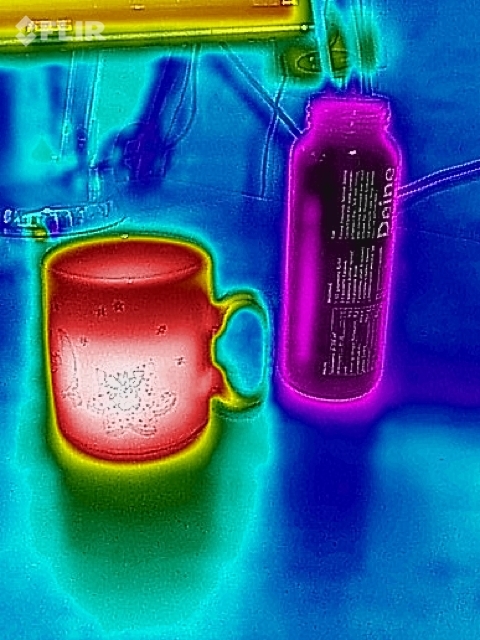 Thanks to the VGA camera, it is still possible to get some extra detail from the thermal image. 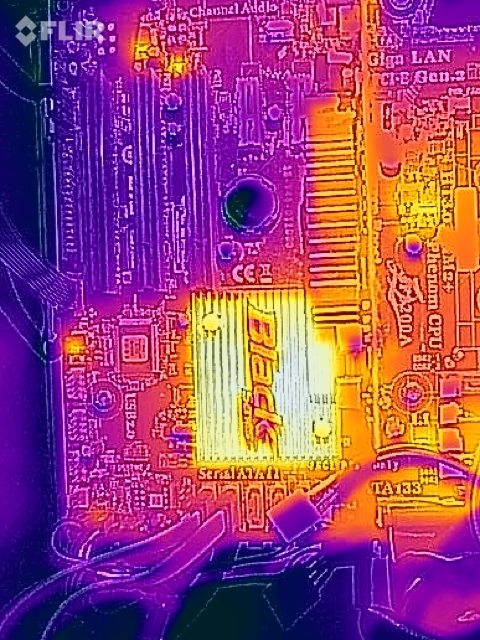 The FLIR ONE can also score points for thermal sensitivity. It is only 0.1 Kelvin and is therefore very sensitive. 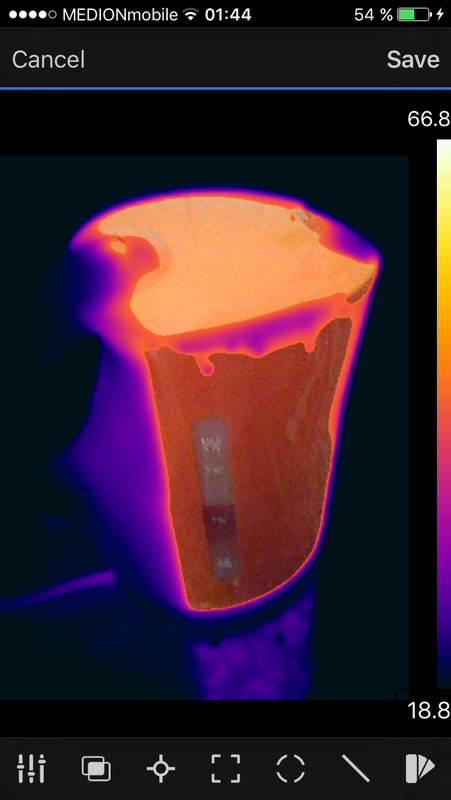 Unfortunately, the detectable temperature spectrum is limited to 120 ° C (248° F). 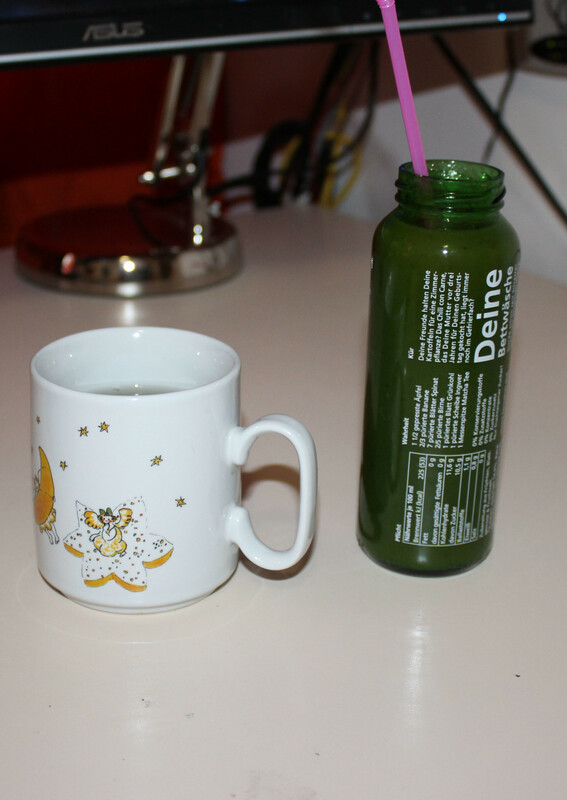 but down to -20 ° C (-4° F). The basic accuracy is ± 3 ° C – a better value would also be desirable here. 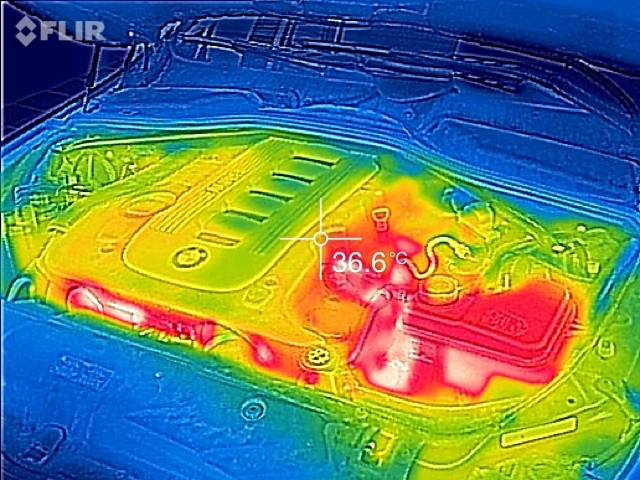 The integrated 350 mAh battery only supplies the thermal imager and does not interfere with the connected device (smartphone / tablet). 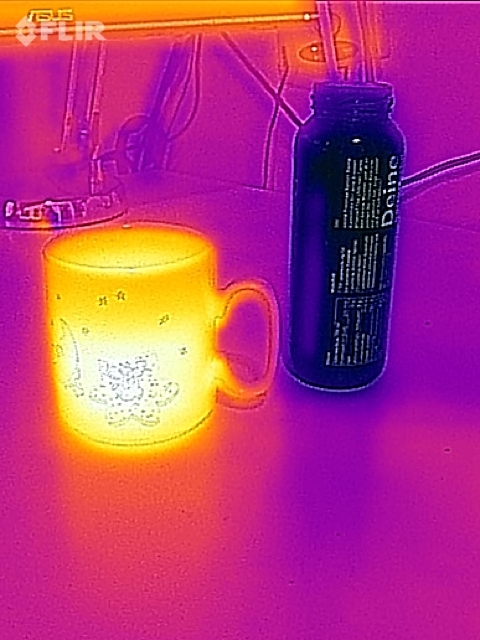 Thanks to the compact FLIR Lepton module, the dimensions are only 72 x 26 x 18 mm (L x W x H) with a weight of only 78 g.
The pictures are stored as JPEG (iPhone 5: 480 x 640 pixels) and additionally separately in a producer-specific format. As a result, the recordings can be adapted as desired after the fact, since only the raw data of the thermal image and the visual image are stored separately. 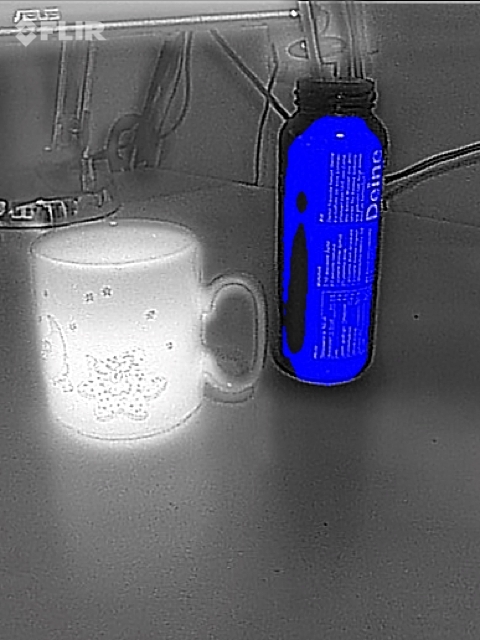 Tthe FLIR ONE records videos in the .mov format. 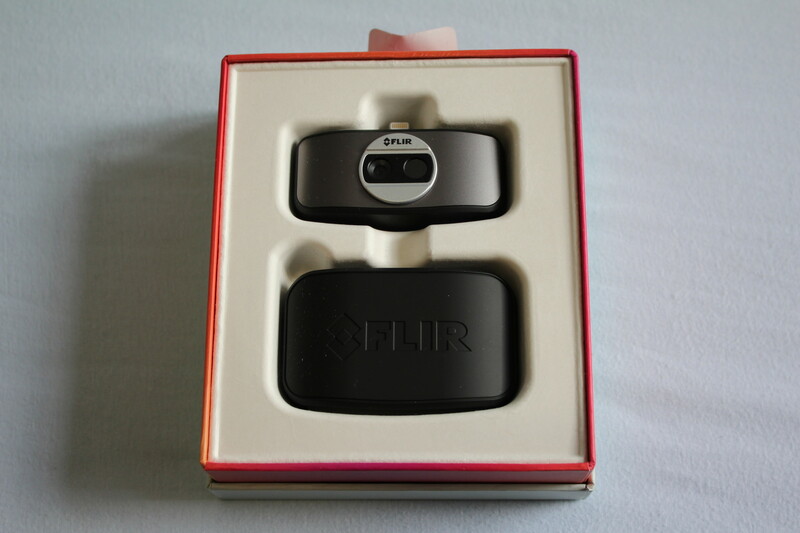 The fixed focus and the FOV as well as the sensor resolution determine the possible applications of the device. 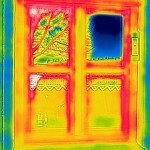 Windows and doors can be examined coarsly for problems and leakages. For this you have to go a little closer. However, the resolution is not enough for construction audits or the like. 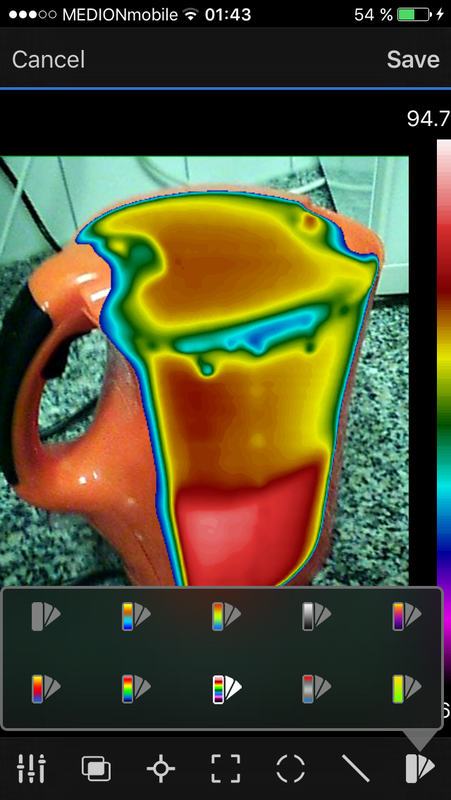 The device is also great for the investigation of heating installations, because the image-combining helps to enhance the images immensely. 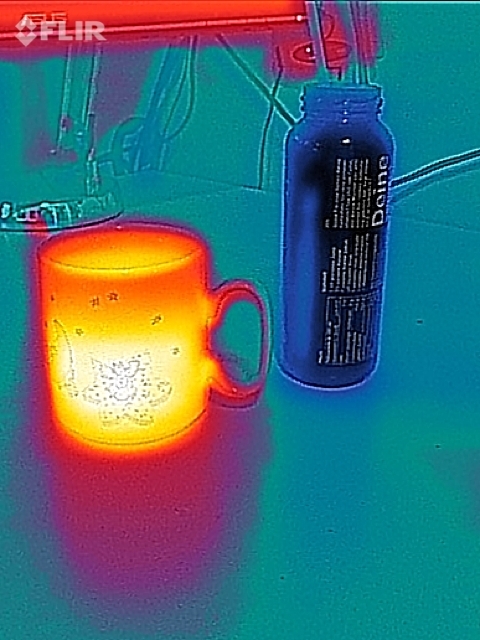 Even in small heaters you get the right FOV. 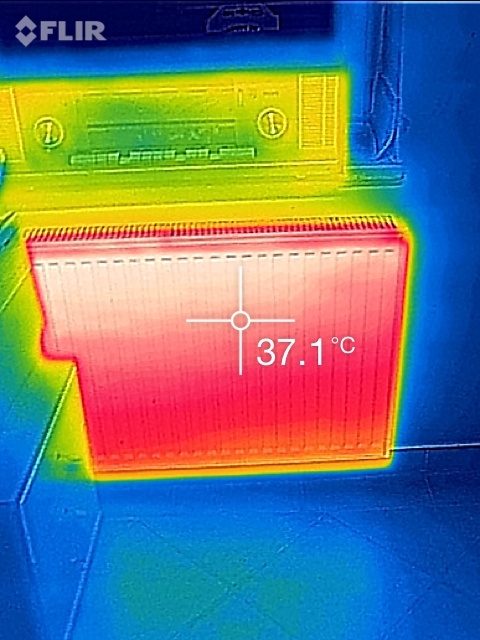 Fireplaces, stoves and heating pipes came out well in the test with the pictures and statements can be made about the heat spreading and insulation. 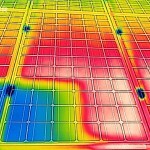 Photovoltaic plants could be investigated for abnormalities in the test. The sensitivity is sufficient to detect the slightest deviations and then to investigate them more precisely. 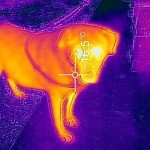 Rather less suitable is the FLIR ONE for the monitoring of property and in the animal search. 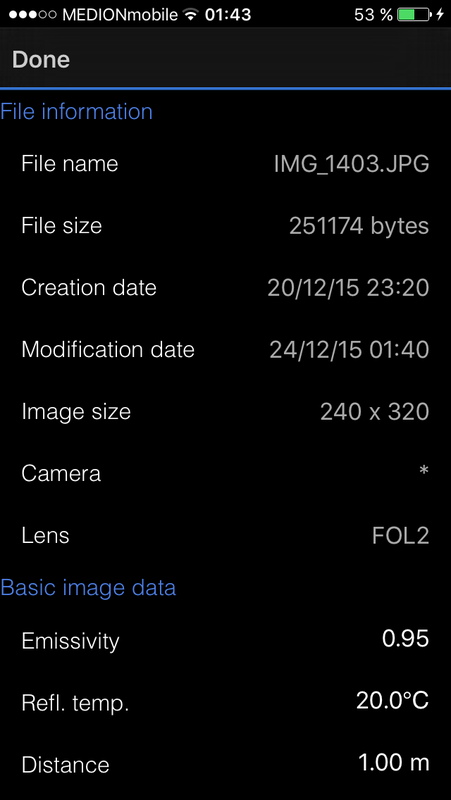 Here, the resolution in combination with the rather wide field of view is too small. 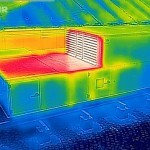 The competitive product Seek Thermal Compact XR provides better results. 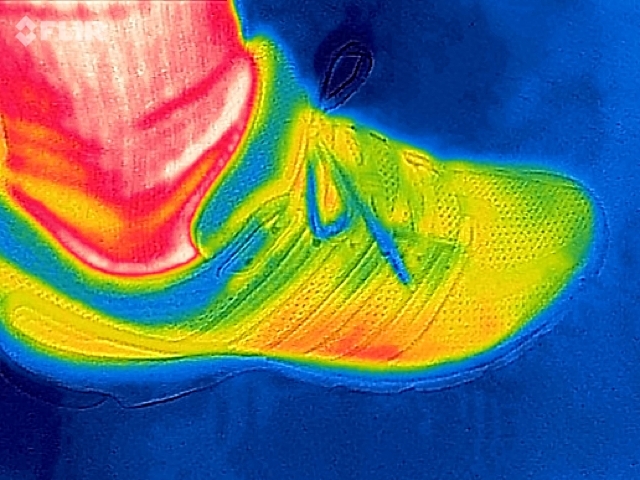 The FLIR-ONE can be used experimentally for quick sports medicine examinations. Inflammation and circulatory disorders can be visualized. 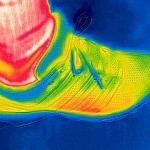 Electronic circuits and electrical equipment can also be scanned for deviations and abnormalities. 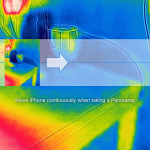 The FLIR ONE for Android / iOS is a sophisticated thermal imaging camera for smartphones. 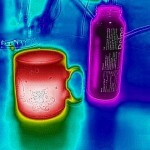 The image quality is powerful and it is useful in many applications. 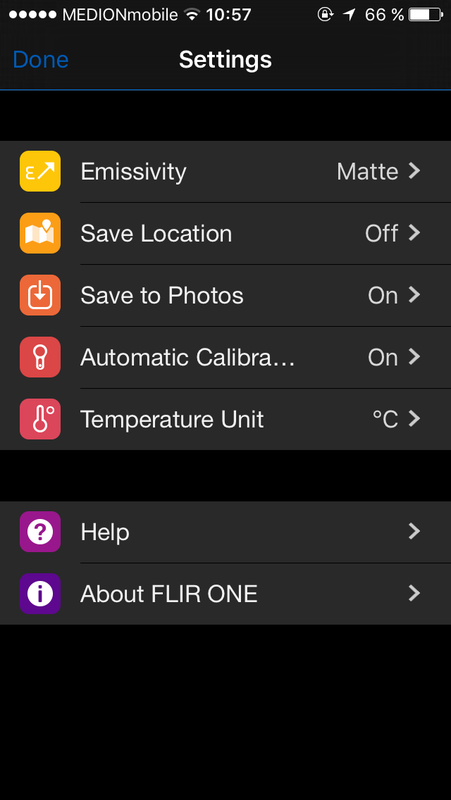 In addition to image-combining, the integrated battery and the analysis app “FLIR Tools” are also available. 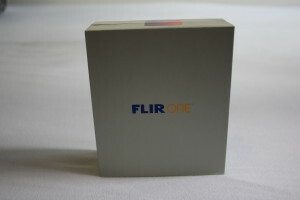 It is very sturdy, compact and can be stored in the enclosed protective sleeve. Also the price / performance ratio convinces and a clear purchase recommendation can be pronounce.